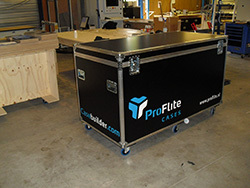 A flightcase is a transportation container used to safely pack and transport anything that needs protection. Heavier versions may be referred to as road cases, and the terms are fairly interchangeable, with road case being the more common term in the United States. Originally, such cases were used by rock and roll touring bands to transport sound equipment, lighting equipment and musical instruments. Today, flightcases are used to transport various types of delicate equipment. In addition to providing protection, the case can allow rack mount equipment to be left largely interconnected and ready for use. Custom foam inserts are often created to cradle particularly expensive gear within the case and protect it from shock or vibration in transit. Accessories such as slide-out drawers, flip-out tables and hanging clothes bars can be incorporated into the design to create portable wardrobes or workstations.